FARMVILLE, VA—Explaining that the extra bit of effort would go a long way in helping the candidate improve his appeal among voters, a top campaign aide to Governor Mike Pence reportedly encouraged the Republican nominee to try out some more happy-looking scowls for the vice presidential debate Tuesday. 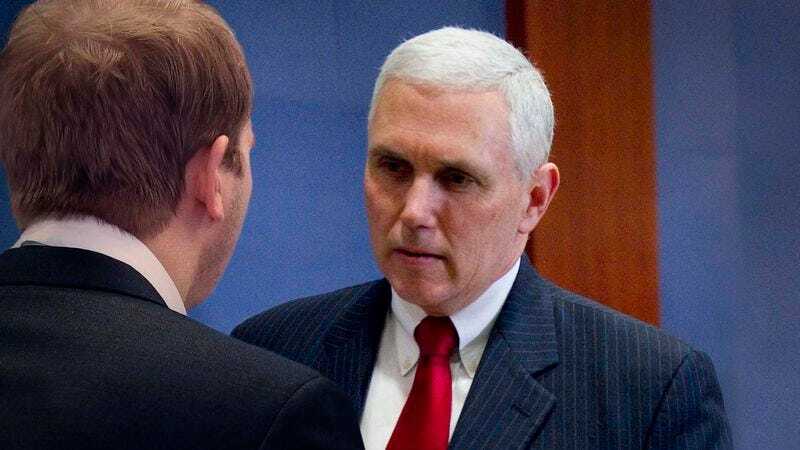 “Maybe tonight you can try to scowl with a bit more joy just to show people you’re excited to be here and looking forward to discussing the issues,” said senior Pence advisor Nick Ayers, adding that a more carefree grimace or cheerier stern glare would allow the candidate to show off his lighter side and help him connect with potential supporters. “Think of the kind of frown you’d have while watching your child perform at a school recital, or maybe the way you pleasantly glowered when you saw your wife on your wedding day. Just try to put a more exuberant sneer on your face—that will really resonate with people.” According to sources, Ayers later decided Pence should actually just stick with his regular scowl, as watching the Indiana governor attempt to appear more gleeful just made him look that much scarier.